Whenever I return from Papua New Guinea, I’m quite literally speechless. 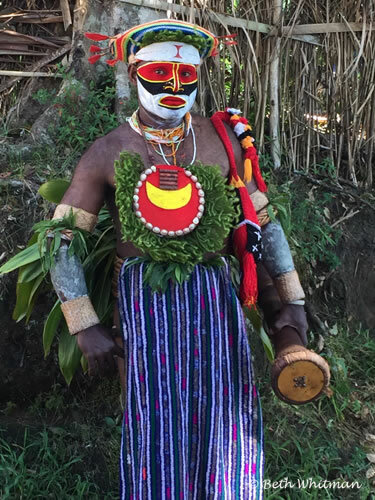 While on our tour to PNG, we attend no less than two different singsings (festivals) over three days and during that time we see about 100 tribes from around this half-island nation. Each tribe wears traditional festival outfits that distinguish them from other villages. These outfits might be worn during times of war, marriage or other celebrations. Within a tribe, individuals dress in accordance with their tribe, with the paint on their faces and bodies all looking pretty much the same as those in their clan. In addition to their body art, their dancing mimics the vast array of birds found in the in the wild throughout PNG. And just as male birds are more vibrantly colored than females, the men dress more vibrantly than the women. 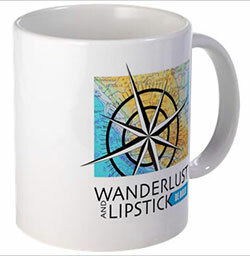 There is a lot of pride that goes into the donning of the makeup and outfits. They may not always look friendly or inviting but, trust me, they are quite happy to have their photos taken. As a matter of fact, they are bit disappointed if you DON’T take their photo. 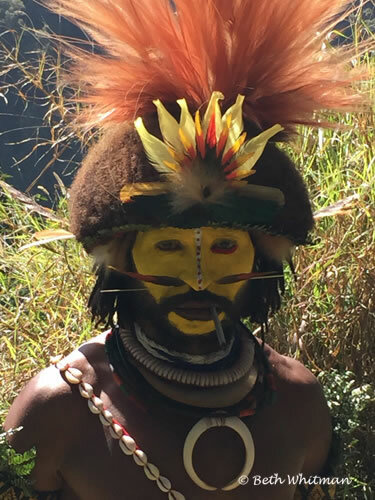 Prior to the singsings, both the men and women spend hours in the morning peering into a tiny mirror to get their face and body paint just right. Someone helps with their hair and feathers when necessary. We always arrive at the showgrounds at least two or three hours in advance of the singsing to see them applying their makeup. This is usually the most fascinating part of the day as it gives us a chance to mingle with the groups before they start performing. Our 2016 Mt. 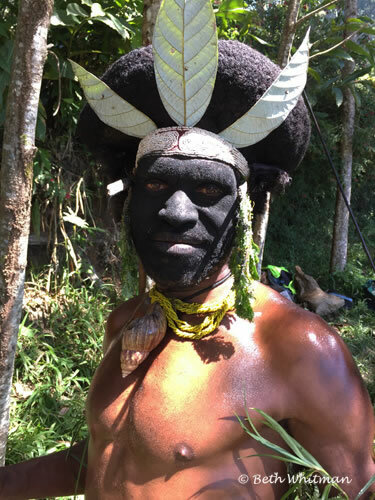 Hagen Show Tour is already sold out (although we *might* have space for one woman if she’s willing to share a room) but you can let us know if you’re interested in joining us and we can put you on the waiting list for the 2016 tour or future trips to PNG.